My friend Wendy sent me this New York Times story on a new Camembert made from pasteurized milk that aims to be as good as ones made with raw milk. 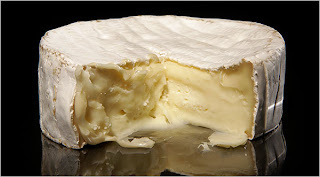 (If a cheese is made with raw milk it must be aged at least 60 days before it can be sold in the U.S. That doesn't work so well for Camembert!) Time for a trip to Whole Foods! Update: So apparently H. Mons made a deal with Whole Foods so that they'd be the only distributor of his cheeses. That'd be fine by me, I guess, except every WF I've been to (in both Los Angeles and San Diego) has been sold out since the holidays! They keep telling me they're waiting for another shipment, and to stay tuned. So until then, no camembert for moi! It ages in two weeks and is super simple to make. No driving around to WF!